My dad has raced his whole life so I was at the track as a baby and first rode and raced my PW when I was 3 with OCMC. My mom and dad also chaired the mini track series at OCMC for a few years so we never missed a race. I like all the tracks that I go to but my favourite is Cochrane’s because of the flow and the layout. I also like Area 51’s nightcross track and have had good success there. Muttco is a great, challenging sand track – every bit as tough as Gopher Dunes’ big track. I’m happy to have conquered all the big jumps at Muttco and Madoc, something I worked really hard on this year. Cole Thompson because he’s so smooth. 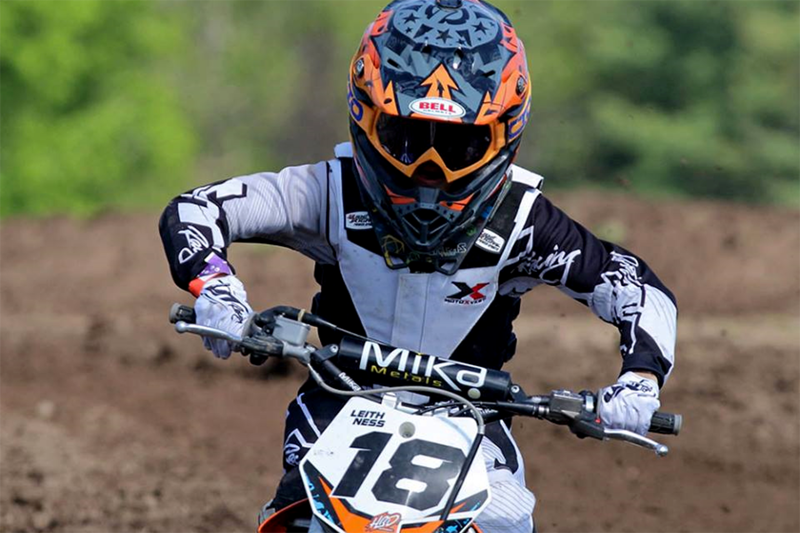 Cole, his brother Jay, and Dan are my coaches at MX Schools. Kyle Keast is pretty cool too and always talks to kids. He always smiles and takes the time to stop and talk to people. He’s a really good role model. My dad is because he’s my coach and mechanic, he gives me the cleanest race-ready bike and gear every weekend (and I know you’ll like that, Jeff). It’s also good to see him back riding again after a really bad accident at Rocky Ridge. He also works so hard to make sure I get on the track for my races, even when it means he has to miss his own races sometimes. My goals were to win. Jay and Cole Thompson have worked hard on keeping me smooth. Secretly (Laughs), I wanted to work on getting more aggressive and tackling bigger jumps. I wanted to qualify for Walton which I did in two classes, hoping to rank top 10. The track that week was really rutted with some muddy sections. I was doing OK until I crashed and got a DNF while holding a strong 5th in my 1st moto. I crashed again in my 2nd moto which dropped me to 12th. I had some engine problems in moto 3 but in the end I finished 15th overall which, with a DNF, can’t be that bad. It was a hard week but it was our first time, so hopefully better next year. I wanted to win the MMRS National. There are a few. 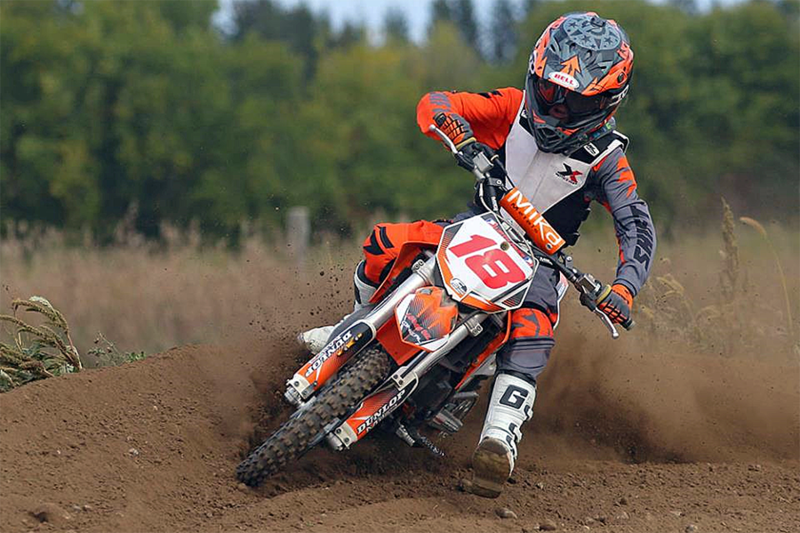 First one would have to be winning the MMRS National Motocross Championship in the 65cc (7-9) class this year. I lost out on wins there twice before, even one time on the 50cc in the last turn! 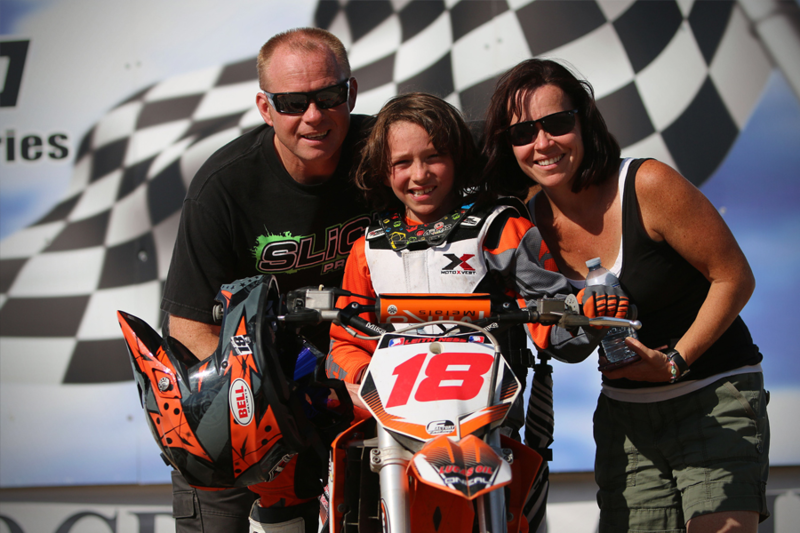 The KTM Jr SX Challenge will always be special and being selected for that was a big surprise. All the riders were treated like Pros all day and night. Getting a big holeshot in front of 50,000 people in the Rogers Centre and finishing with a solid 4th was so awesome. Overall, I’ve had a lot of great seasons. Maybe 2014 where I started the year at the Ricky Carmichael Amateur SX finishing 23rd, KTM Challenge 4th, three MMRS Championships in the 65cc class, also 3rd in the 65cc, 1st in 50cc, a 3rd in 50cc and 4th in the 85cc on my 65. All that was a pretty big year. Qualifying for the TransCan. I was also the youngest of only 3 riders to ever win the OCMC Mighty Mini High Point Award in 2 consecutive years so I was able to ride with the #1 plate for those years. It was great when my family was presented with the Jamie VanEindhoven Memorial Award and the North American International Motorcycle Supershow’s Max Award for Excellence in Sportsmanship. I like to ride my BMX at Joyride 150 and I play motocross games on my iPad. My friend Harmen Boer gave me his PS3 as a gift (he believes it’s a great training tool) and one of my favourite games is MX vs ATV Reflex. I like cross-country running at school. I also like to give my dad riding tips (Laughs). First, thanks to you, Jeff, for giving me this opportunity. My dad for being the best mechanic ever – we’ve only had 1 engine failure in 7 years. My mom for feeding me (even when I don’t want it), my Nana, Aunt Kasey and Uncle Ian for helping me wherever they can. MMRS for giving us the best racing club and putting on great events each weekend, and that doesn’t really say enough about them and their whole team, it’s so much more than just racing. Jay and Cole Thompson, Dan Beaton and Colton Facciotti at MX Schools. Thanks also to Harmen Boer, TrakX, Tom Whitson at GP Bikes, Don Chamberlain at Orange Motorsports, John Nelson at Machine Racing Forever, Factory Backing Graphics, No Toil Filters, O’Neal Clothing, Matrix Concepts, Lucas Oil, Dunlop Tires, Simon Temmerman at Mika Metals. Also, thanks to Harvey Gold, Mao Ouyang and Dawn McClintock for taking great photos all year.